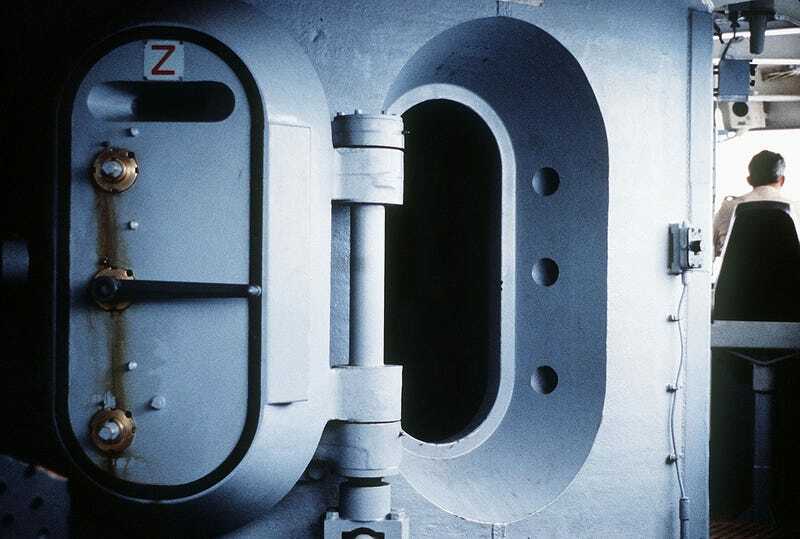 The mighty Iowa Class Battleships are known for their heavy armor, yet their bank vault-like conning towers were possibly the most blatant example of how over-engineered these vessels were so that they could take a brutal beating and keep on fighting. These armored inner-bridges were massive steel cylinders that rose three stories high, from deck three to deck five. Deck three’s conning tower compartment was used by the Admiral and their staff. Deck four’s was used as the primary navigational interface for the ship. 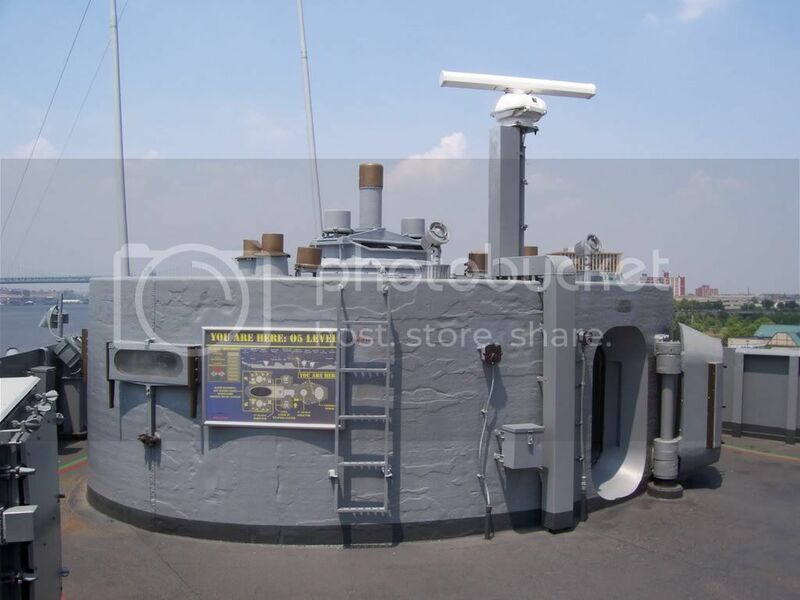 Deck five’s section of the conning tower was used by the ship’s gunnery officers. Aside from the navigational bridge, two other control centers used for steering and navigation existed. This included one on the fly bridge and one in a control room in the lower rear of the ship, near its rudders. The Iowa Class’s conning towers featured 17 inches of protective armor all around, with tiny slits used for outward visibility. A pair of 400 pound doors, one on each end of the bridge, allowed for access into the conning tower. From there the ship could continue to be maneuvered and officers could give orders to the ship’s 1,500 person crew even as the ship was being chewed up by enemy strafing and bombardment or set ablaze. They were among the safest places to be on these fortress-like ships during an attack. Check out a 360 tour of the bridge, the armored conning bridge, and other key sections aboard the the USS Iowa by clicking here. The Iowa Class Battleships were not the only ships that featured such elaborate protection, far from it. Armored conning towers and bridges had been around for many decades before the Iowa’s were built, even falling out of favor before WWII before returning in multiple forms and configurations. Many older surface combatants were based on a design philosophy called “all or nothing armor,” in which only the critical areas of ship received heavy armor while the rest of the ship received a light armor treatment. This proved to be a less than ideal setup, as the armor was mainly built around a central citadel that enclosed the heart of the ship. This left other areas vulnerable even to small caliber shells. The Iowa Class Battleships took a more heavy handed route for protection, distributing armor to much of the ship, and its critical areas even more-so. Instead of relying on a inner armored citadel alone for primarily protection, the Iowa Class’s key components were citadels onto themselves, especially the conning towers, fire control towers and turrets. Even though it was one of the safest areas on the ship, one can only imagine what being in a battle while sealed inside an armored conning tower must have been like. Basically fighting an all out engagement from within the confines of a steel cylinder with very limited visibility. The sound alone, or lack thereof in some cases, must have been terrifying.